Hello DRU Fans! Welcome! 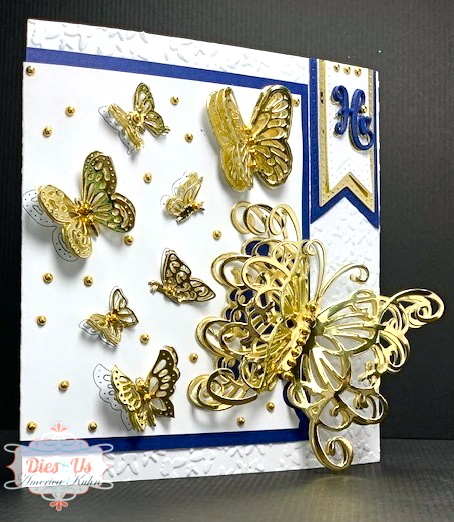 This is America, back to share a fun Butterflies design. 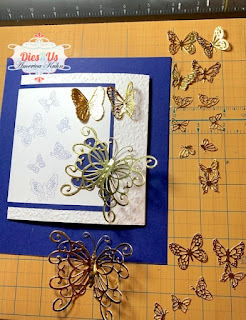 First, I die-cut a card base panel and dry embossed the entire base with a large butterflies EF for some extra texture. Then, I Hot-Foiled the Butterflies with Navy Blue Foil directly onto another piece of White Cardstock. 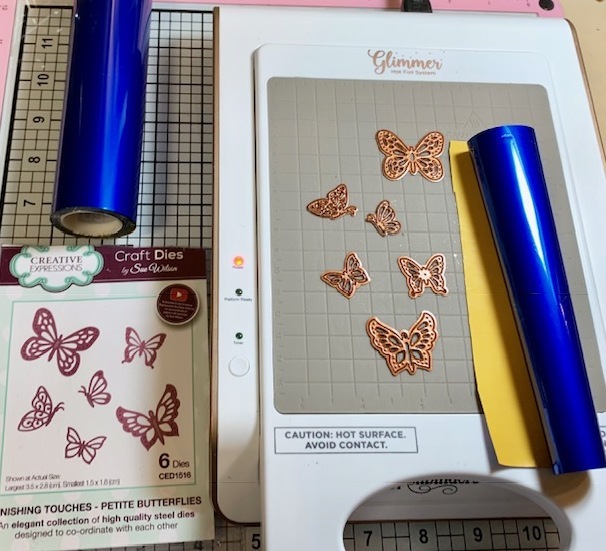 Doing this technique "Hot-Foil Stamps" the outlines of your die designs. 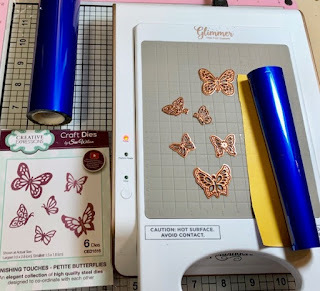 Next, I Die-Cut the large butterfly off the edge of top white layer and backed it with a Navy layer to show the color through the butterfly. I also die-cut the smaller butterflies out of Gold Mirrored Cardstock, adhered them in layers and bent the wings of each with tweezers. Doing that shapes and adds fun dimension. 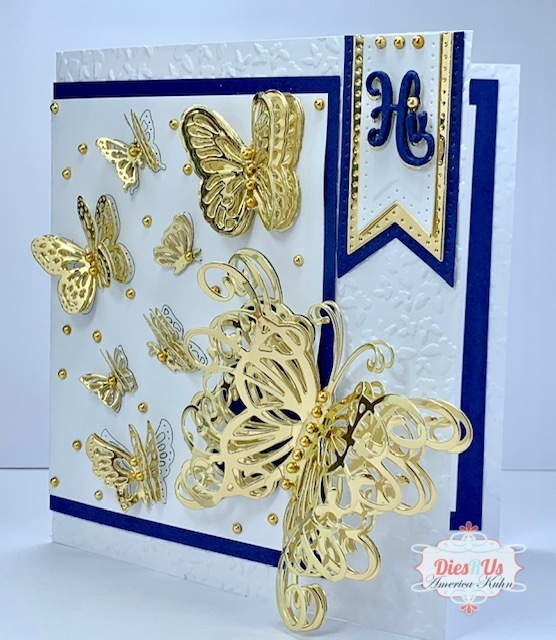 After layering the Butterflies, I die-cut the "Hi" sentiment multiple times, out of Navy and Gold Mirrored Cardstock then adhered in layers and placed it over a die-cut layered Pierced Flag panel. The pierced flag panel was trimmed and adhered at top edge. 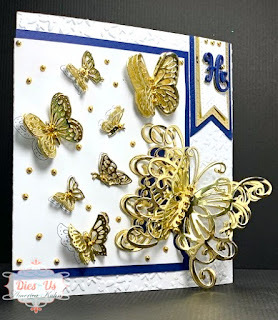 Gold gems were randomle placed throughout design and onto the centers of the butterflies for added interest. That's it! So easy! Hope youll give this a try! 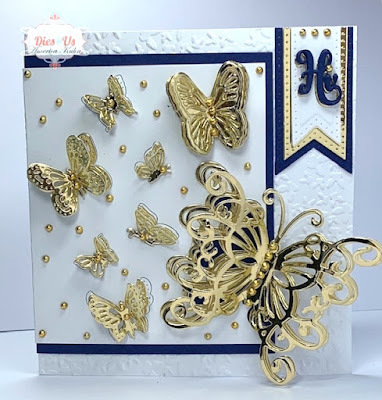 Creative Expressions Deep Blue Foundations Card -also by Sue Wilson, CE Gold Mirrored Cardstock, 110lb White Cardstock, Navy Foil, Gold Flat-Back gems. That's it! Hope you'll give these fun Cutting Dies a try! Another GORGEOUS design creation America! You are the layering queen and those foils are just beautiful! Thanks for inspiration and details. Wowza! How gorgeous is this!! Well done! Beautiful, America. I like all the gold. Stunningly beautiful! 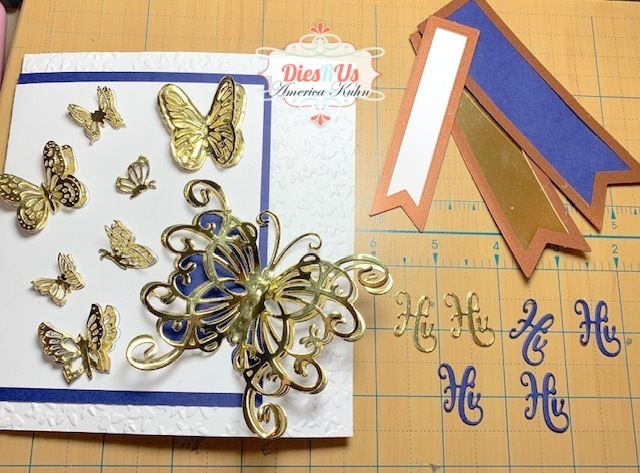 Love the all the layers in the gold and blue mirror cardstock. I keep going back for one more look :-) Gorgeous!